The oldest city park in the United States, the Boston Common dates back to 1634 when the land was used as a community cow pasture. The historic site was also used as a camp by British soldiers during the Revolutionary War on their way to the Battle of Lexington and Concord. The start of the Freedom Trail, this gorgeous public park of 50 green acres is the perfect spot for a relaxing stroll, public events, and an educational trip in Boston. Learn about the public hangings done on the site until 1817, or the riot which occurred here in 1713 when over two hundred Bostonians starved for bread, attacking the ships and warehouses of wealthy merchants. Visit the Central Burying Ground in the park where Boston locals and notable individuals from the 18th century find their resting place. In 1987 the park was dedicated as a national landmark not only for its historic start but for the notable people who have spoken and performed on its grounds such as Pope John Paul II who spoke there in 1979 as well as Martin Luther King, Jr. 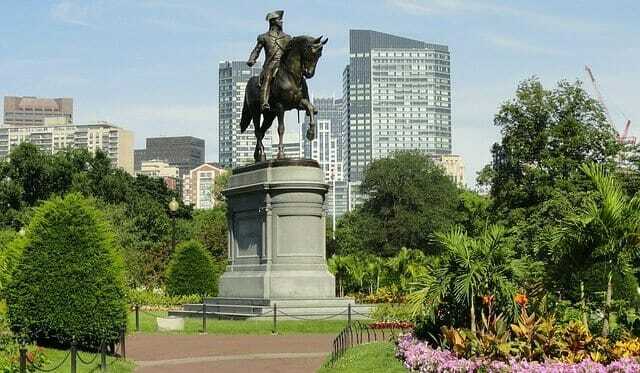 Whether you decide to visit the Boston Common to begin your Freedom Trail tour of the city or you're looking for a relaxing day of recreation in a busy city, the Boston Common is a wonderful place to start or end any day.